Travelling with a baby can be stressful, but the obstacles it presents don’t have to be insurmountable. Gathering travel documents, investigating airfare and accommodation ahead of time, packing proper clothes for all family members and setting itineraries that provide plenty of breaks for everyone’s comfort will all help parents travelling internationally with their babies enjoy their trip. International travel requires proper travel documents for all family members, including babies. A baby born in the UK requires a passport to travel abroad and parents can pick up the necessary forms at a local passport. Proof of the baby’s birth and approved photos of the baby are required for such applications. Families travelling to countries that require visas will also need to apply for one for their baby. Cheap flights abound in this day and age, but parents should read the terms and conditions of all airline tickets carefully before purchasing any of them. Whether or not a seat is required for a baby, if the carrier charges more for transporting baby carriers such as prams, how much luggage family members can bring and whether or not there will be a charge for a change of travel dates can all influence a parent’s decision about selecting airfare for international travel with a baby. Thinking about how to entertain a baby during flights might also influence if parents want to travel long-haul or short-haul. Some parents may decide that air travel is not the best option and may be more interested in travelling by train or ferry instead. Women interested in travelling during pregnancy should discuss their options with their doctors and check airline policies on any limits regarding pregnancy and flying. Before parents decide where to stay with their babies they should pay close attention to world news and Foreign Office travel warnings to see if there are any reasons that they should not travel to a specific location. Most parents investigate hotels or apartments when travelling abroad with a baby. Questions such as whether or not a crib is available, if rooms come with refrigerators and/or facilities for heating bottles, if cooking facilities such as a microwave are available and if there is a way for parents to wash nappies or clothing are all common when parents investigate accommodations for international travel. One of the most basic rules of parenting is to keep children properly clothed and this becomes even more important when travelling abroad. Parents should look at specific weather forecasts and general climate trends for their intended destination and pack the bulk of their baby’s clothing to match these conditions. However, parents should also pack at least one outfit that would work in the exact opposite weather (for example, winter clothes for a hot destination, summer clothes for a cold destination) to make sure that their baby will be comfortable in even the most freakish weather. Parents may also want to pack more clothing for babies than they would for themselves given that babies tend to dirty their clothes more quickly. Travelling with a baby will necessarily require breaks for feeding, sleeping and changing. 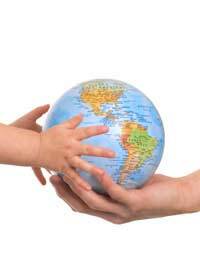 This usually means that travel itineraries will cover less ground than they might if parents were travelling alone. However, parents should remember that taking breaks to keep everyone comfortable will help everyone feel more relaxed and enjoy the trip even if they don’t see as many sites as they might otherwise. International travel with a baby requires careful planning. Gathering travel documents, investigating airfare, investigating accommodations, packing properly and setting itineraries with care are all activities that parents can undertake to make their international travel successful before they ever leave home.